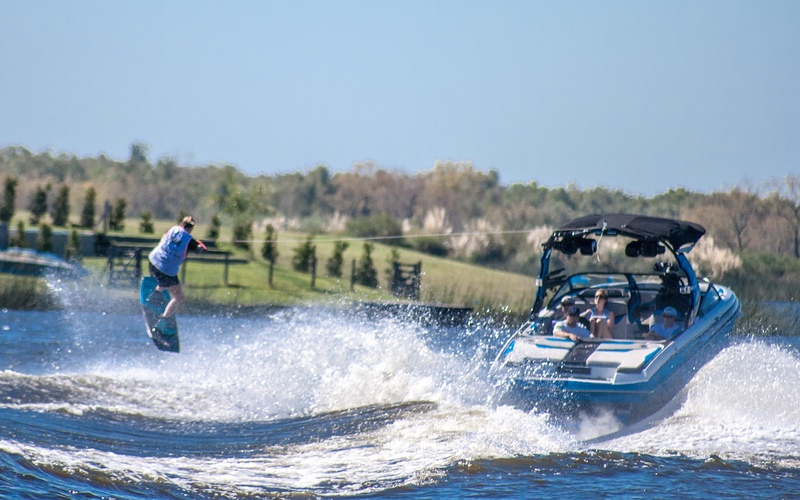 Day 5 of the IWWF Wakeboard World Championships brought the Masters Ladies Final with two Brits, Sarah Partridge and Emma Phillips, battling for the podium with competitors from Hong Kong, Italy, and Argentina. RAF and Team GB rider Sarah Partridge took 3rd place in a nail biting finish to the Masters Ladies competition. Emma Phillips set off down the lake opening up the category final, going straight out after Cory Teunissen’s Open Men Semi Final run. Emma was the only rider to put down a stand up pass in her category with no falls. Her run included tricks such as Indy grab, grabbed Stiffee, ts 180, hs 180, half cab. With only 7 points between all riders Emma was unlucky to end up off of the podium. Sarah Partridge rode 1 from last in the heat and cut out with determination. She went wake to wake heel and toe followed by a heel indy grab and a big toe w2w 180 landing clean. On her second pass Sarah hit choppy water on landing her first trick, taking a crash, but got straight up and went directly into a slob grabbed heel w2w 180. This nailed trick plus the rest of her ride secured 3rd place and a fantastic Bronze medal for Sarah and Team GB. Sarah was over the moon along with Team GB to get a podium finish. All of Team GB and Wakeboard UK are proud of Sarah's Podium finish and would like to congratulate both ladies for their achievements, efforts and team points.